With the wedding season right around the corner, we can smell love in the air and also hear the cries of grooms and brides as they evaluate their wedding budget. Who wouldn’t shed a few tears when the average wedding is nearly $35,000 — more than half the median annual household income ($55,000)? And results in 74 percent of couples going into debt according to a recent survey. There are so many options for brides nowadays and it doesn’t mean you need to blow your savings on a designer dress. Many brides can still get their dream dress for a fraction of the cost. For instance, there are several online retail sites that sell chic wedding gowns for under $500, including sites like TopShop, Lulu’s, Reformation, etc. If you’re not crazy about that approach, you can rent big name designer dresses from sites like Rent The Runway or buy once-used designer wedding gowns. All of these options are considerably less than purchasing a new designer dress and will likely save you hundreds (maybe even thousands) of dollars. It costs today’s couple over $200 for each person to attend their wedding. Before you invite your second cousin, ask yourself: would you take this person out to a really expensive dinner? If the answer is no, ‘guiltlessly’ take them off your list. Less people = less money towards food, drinks, silverware, tables, chairs, linens and so on. 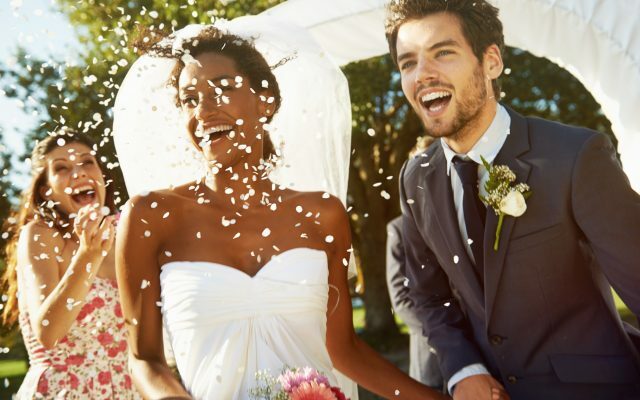 Your wedding should be celebrated with your most loved friends and family members — and not used as an excuse to reconnect with old companions and distant relatives. Well-known wedding venues are losing popularity due to their big price tags. Today’s brides and grooms are stepping out of those conventional settings and booking their big day at unique locations, including pop-up barns, historic libraries or renting large homes with sprawling backyards to cut costs. What’s more, many couples are forgoing evening sit-down dinner receptions for brunch-themed weddings. In fact, couples who have their big event at an earlier time or wait till the off season, during a Thursday, Friday or Sunday evening — as opposed to Saturday night (the most popular day and time to host weddings and events) — can usually recoup thousands of dollars. Couples can spend up to $5,000 or more on flower bouquets, boutonnieres and centerpieces. That’s why many soon-to-be-newlyweds are ‘DIYing’ centerpieces, and using other visually appealing and rustic items like lanterns, candles or fruit to offset the high price of florals. Brides and grooms are also gravitating toward more simple and classic bouquets/boutonnieres, featuring a single-stem flower as opposed to more extravagant arrangements. These seemingly small changes can carve 70 percent or more off of flower and decoration costs according to The Knot. Not bad, eh? The average age to get married is at an historic high (age 27 for women and 29 for men), meaning couples are more established and less in need of those traditional gift registries featuring a myriad of kitchen items. But they still need one thing: money. Sites like HoneyFund and Our Wishing Well allow couples to tactfully register for experiences or receive money directly, so they can save for a home or their honeymoon. More couples are ditching expensive, multi-tiered cakes and the cliché cake cutting ceremony, opting instead for bite sized desserts like truffles, macaroons, tarts, donuts or cupcakes. That’s not a bad idea since most caterers charge a cake cutting fee. Many venues and caterers can charge up to $500 or more to ceremoniously pass flutes of champagne around. If you’ve been to a wedding, you know that great moments or speeches don’t revolve around what’s in your glass. As an alternative, consider a glass-in-hand toast to avoid the wasted champagne, extra expense and distracting coordination. In an effort to make their day a little more cost effective and sentimental, some couples are saying ‘no thanks’ to paying for an officiant, choosing to have a close friend or family member officiate their ceremony instead. Luckily if you live in the state of Colorado, you’re not required to have a licensed celebrant. Great rule of thumb here: don’t blow your budget on things that will inevitably be thrown away (e.g. wedding programs or return RSVP cards). Instead, consider setting up a free wedding website where guests — after they receive the physical invitation — can easily RSVP online. The Knot and Weddingwire.com offer several easy-to-use websites with RSVP capabilities. Today’s soon-to-be-newlyweds are skipping tired party favors, recognizing guests sadly toss ’em or leave them behind. In lieu of forgotten keepsakes, couples are choosing to enhance the guest experience by offering sip stations or passing after-dinner treats for late night party-goers. While this isn’t necessarily expensive, the idea of marching your single friends on stage—blaring Beyoncé’s “Single Ladies” or a bad-boy equivalent song, as they fight over a bouquet or garter—irks many brides today. And who can blame them? Brides are ditching the bouquet toss and instead presenting it to their parents, the couple who’s been married the longest or honoring a loved one’s memory. Thanks for your response. We’re glad you enjoyed the article! So true, Dianne. We’re glad you enjoyed the article. Good luck to you and your daughter on wedding planning! We wish you the best! As a person that was recently married, I couldn’t agree more with FirstBank. So many weddings items have become tradition and people do them out of obligation. Flowers are a huge part of that – people are going into debt because they feel it’s a once-in-a-lifetime experience. If florist are losing money because people are finally being smart with their money and not going into debt to get married, then maybe florists need to change their marketing and look for other successful ways to make money – not rely on people making poor life choices of going into debt before they start the rest of their lives – just my humble opinion. We paid money for our venue (Hudson Gardens) and our caterer, but bought our own table cloths, our own decorations, a friend bought local flowers and arranged them, hair was done by my wife’s sister, borrowed a sound system from church, a friend DJ’d, brought some of our own extra tables instead of renting, a friend gave us a deal on photography (still paid $1k) bought our own alcohol from Davidson’s (which allowed us to return unopened cases), father-in-law built an awesome bar. Was there some things we wished were done differently? Heck yes, but that’s going to happen weather you spend a bunch or a little. We overspent by a couple thousand or so dollars: about $13k in the end but we could have easily spent $20 – 30k. People getting married almost need to come up with a mission statement or vision. What’s really important to them? For us, it was to have our friends and family celebrate an important day with us and to do that without going into debt. Unfortunately unexpected items will come up just before the date, and some of that went on our credit card, but we made a point to have a zero balance so in the end that has since been paid off. Getting married is full of sacrifices and the sooner both the bride and groom realize that, the better. Do you want to spend $20k well then maybe you’ll keep driving that old beater for another 2 years or you’ll buy less home for your first house or continue renting, eat out less often OR end up saddled with tons of debt going into your first year of marriage. Just hoping people can learn from out mistakes and wise decisions. Great points and suggestions, Jason. Thank you for your comment.